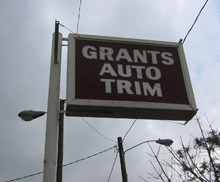 Grants Auto Trim, Inc. works on current year model vehicles and restores older model cars and trucks. We are located at 1600 Broad Street , Chattanooga , TN 37408 , we are just off Main Street , downtown. Our phone number is (423) 266-3772. We look forward to serving your automotive upholstery and sunroof needs. Please call us or come by anytime.